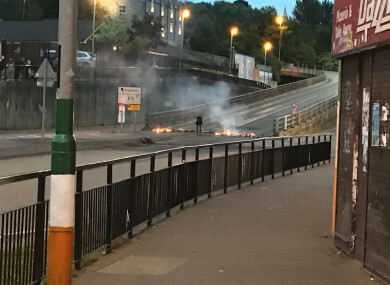 A fire which was started at the bottom of the flyover in the Bogside area of Derry. POLICE IN THE North say that rioters in Derry tried to murder them last night. Disorder broke out in the city for the sixth night in a row last night, this time in the Bogside area. The trouble broke out after Twelfth of July marches made their way across the city earlier in the day. Three people were arrested in the disturbances. Two improvised explosive devices were thrown at police officers in what the PSNI called a “prolonged and sustained attack”. 74 petrol bombs were thrown. “I am saddened, disheartened and frustrated that yet again police officers committed to keeping this local community safe have been attacked by a small number of people within it. “The 22 year old had been arrested for attempted murder. Last night’s trouble followed days of trouble in the North. Sinn Féin MLA for Foyle Karen Mullen told RTÉ’s Morning Ireland that a small number of children had begun engaging in “anti community behaviour” in recent weeks. Email “'A miracle officers weren't injured' - Police say Derry rioters tried to murder them”. Feedback on “'A miracle officers weren't injured' - Police say Derry rioters tried to murder them”.